Thank you, Dawn Kinzer and the Seriously Write Team for having me on their blog today. Enjoy my post," Prayer, Patience, and Planning Your Word Count." Each author enjoys a sense of accomplishment when numbers rise on their word count. Have you ever noticed someone on social media announce an addition of one thousand or more words to their manuscript in a day? How exciting! I quickly congratulate whoever is making progress. Our situations and routines are different, though. Don’t get discouraged if you only write a few paragraphs daily. Go at your own speed. Quality outranks numbers, and numbers will grow in time. After attending numerous workshops over the years, the consensus is still the same. They all teach to write your story while ideas flow, not stopping to edit, correct punctuation, or refrain from using the same adjective. Simply write and focus on the story. I follow several proven methods and continue learning tons of information from writers and speakers at workshops or conferences. 1. Pray for direction. As a Christian, I want God’s will in whatever I write as well as whatever I do. 2. Have patience with interruptions. They will happen. Stop if they are important, and address the problem. I type one more thought concerning my story before leaving it. This prevents returning, and staring at the page, lost. 3. Plan a set time and place to write daily. This applies to all age groups. I met a young woman at a conference who had two children of preschool age. She was frustrated with her word count and ready to stop all attempts at writing. Upon discussing what her typical 24 hour day involved, it was apparent she had too many tasks to complete. Writing while her children took an afternoon nap wasn’t an option. What worked for her? A simple notebook. Ideas were recorded as she spoon fed the baby three times a day. At night, after the children were in bed and as laundry sloshed in the washer and clothes spun in the dryer, she constructed sentences. It was ‘her time’ and proved to not only be relaxing for her, but a workable method to write her novel. After completing several pages or a first chapter, I print each page and read them out loud. Often, I have omitted a word I thought I typed. Next, I ‘tighten up’ the story by removing all unnecessary words such as that, etc. Explore the find button on your Microsoft 10 word doc, enter and track down excess words to delete. How many times did you use the same word on the same page? How many times did you have someone smiling, or coughing? Change the repetition. Is someone sad? Show action, don’t tell it. This pulls a more detailed description from you. Keep polishing in this manner, and have it critiqued. With suggested edits, stay true to your style. It is your own unique voice. 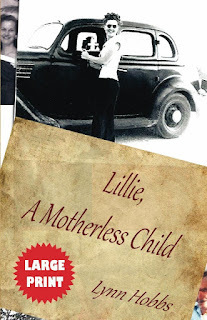 The true, life story of Lillie Fritsche; one of sixteen siblings, born in the depression era. 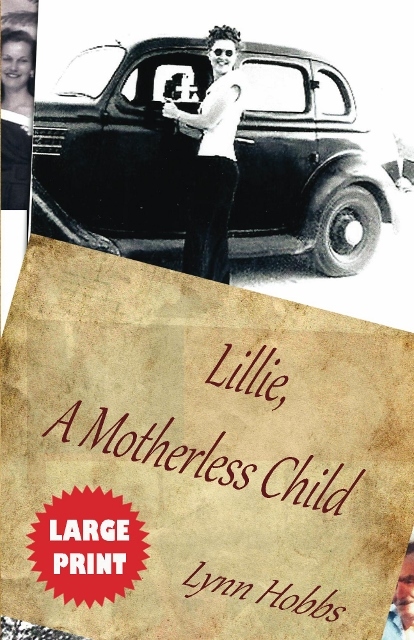 Lillie’s mother passed away when she was seven years old. Follow her journey from a motherless child to an inspiring woman of faith. As per many reader requests, the printed version is available in a Large Print Paperback, or a handy on the go Digital Download for your Kindle device in regular print. Book includes treasured family photos, and some of her favorite, handed-down German recipes. I hope you will enjoy this glimpse of her life narrowed down to 430 pages in the large print paperback. Lynn Hobbs, author: Running Forward Series; a powerful faith and family saga.